Missing dog – what would you do? Hey, I need your help. 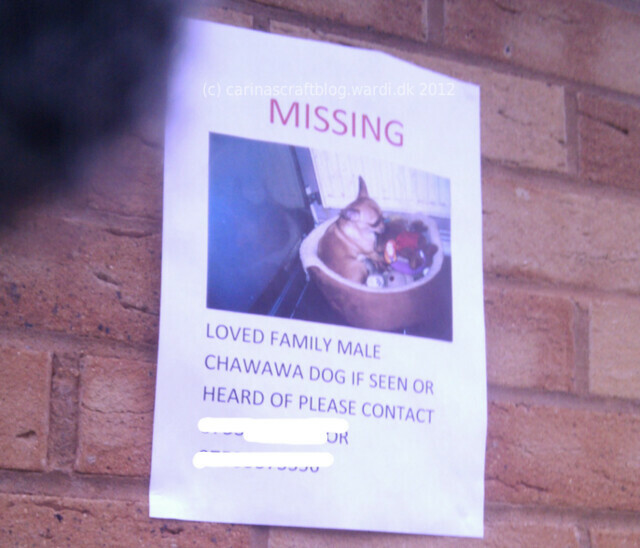 Today I saw this flyer about a missing dog. The other day I saw that dog all on its own on the pavement by the gates to the flats where we live. When I saw the dog, I called Tony “should I do something about thi-” but then another lady picked it up. At first I thought maybe it was her dog – I asked her, and she mumbled something about it coming from in here, meaning the flats. So I thought, well, she must know where the dog lives. But then today I saw that flyer, and now I’m wondering what the heck happened to the dog. And whether I should call the owners. But the dog may already be back home. But it could also not be home, maybe that other lady kept it. She seemed a bit strange, you know. Or maybe she was nice and kept it because it didn’t have a collar or tags or anything and she doesn’t know what to do with it. And then it would be nice for the proper owners to know the approximate whereabouts of the dog. Or maybe the dog came home already and has escaped again, in which case my calling these people won’t help at all. And as far as I can tell from the calls I’ve made to Tony it was on January 27th, so it’s quite a while ago! But the flyer looks quite new, and doesn’t show any signs of being outside for long – it snowed on Saturday, so surely a piece of paper would look a bit worse for wear..? So. Um. What would you do? Edit #1: I’ve tried calling the phone numbers, but haven’t reached anyone yet. Hopefully, I’ll get hold of someone tonight. Fingers crossed. Edit #2: Got hold of someone who was very happy to hear that someone had seen the dog. The dog did go missing about 2 weeks ago, so about the time I saw it. It’s starting to look like that lady simply pinched the dog. Seriously, who does that?! Call them! Give them the information you got. If it was my dog I would be very happy to hear from you! Good luck!